The vision of the Maimonides Heritage Center includes inspiring people to gather in groups and study and discuss the various works of Maimonides. Maimonides was way ahead of his time politically, theologically and medically. His legacy is not only relevant today but remains a compelling religious and philosophic voice in modern man’s / woman’s quest for a spiritual community and for personal equanimity. '...I live in Fostat and the Sultan resides in Cairo; these two places are two Sabbath limits (marked off areas around a town within which it is permitted to move on the Sabbath; approximately one and a half miles) distant from each other. My duties to the Sultan are very heavy. I am obliged to visit him every day, early in the morning, and when he, any of his children or any one of his concubines are indisposed, I cannot leave Cairo but must stay during most of the day in the palace. It also frequently happens that one or two of the officers fall sick and I must attend to their healing. Hence, as a rule, every day, in the morning I go to Cairo. Even if nothing unusual happens there, I do not return to Fostat until the afternoon. Then I am famished, but I find the antechambers filled with people, both Jews and Gentiles, nobles and common people, judges and policemen, friends and enemies - a mixed multitude who await the time of my return. I dismount from my animal, wash my hands, go forth to my patients and entreat them to bear with me while I partake of some light refreshment, the only meal I eat in 24 hours. Then I go to attend to my patients and write prescriptions and directions for their ailments. Patients go in and out until nightfall, and sometimes even, as the Torah is my faith, until two hours or more into the night. I converse with them and prescribe for them even while lying down from sheer fatigue. When night falls, I am so exhausted that I can hardly speak. Let us know what you are doing. Help us create a virtual community. 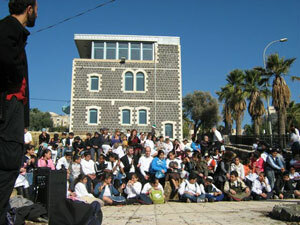 Invite Rabbi Yamin Levy to visit your community and come and visit us in Tiberias.